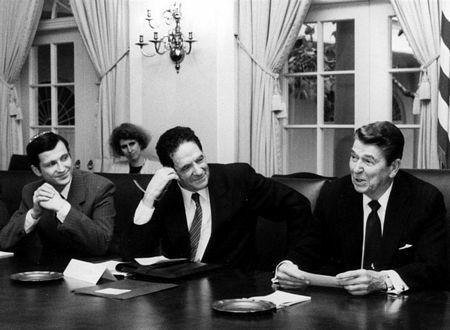 In the Cabinet Room of the White House yesterday, President Reagan met with members of the Jewish community who plan to lead a demonstration December 6 on behalf of Soviet Jews. The demonstration is being held in Washington to lend support to the President in his efforst to secure the freedom of Soviet Jewry, and will take place one day before the arrival of General Secretary Gorbachev. The President wanted to meet with the group before the U.S.-U.S.S.R. Summit to express his commitment to the cause of Soviet Jews, and to assure the Jewish community that the plight of Soviet Jewry will be an issue at the Summit. The President also wanted to hear from the Jewish leadership regarding their concerns and to find out what they think we should be demanding from the Soviets on this important human rights issue. At the meeting were three recently freed Soviet refuseniksâ€”Yuli Edelstien and Vladimir and Maria Slepakâ€”all of whom thanked the President for ensuring their release. Also attending the meetings were: Morris J. Abram, Chairman, National Conference on Soviet Jewry, New York City; Jerry Goodman, Executive Director, National Conference on Soviet Jewry, New York City; Alan Pesky, Chairman, Coalition to Free Soviet Jews, Stamford, Connecticut; Michael Pelavin, Chairman, National Jewish Community Relations Advisory Council of Jewish Federations, Baltimore, Maryland; Pamela B. Cohen, President, Union of Councils for Soviet Jews, Chicago, Illinois; and Martin Stein, Chairman, United Jewish Appeal, Milwaukee, Wisconsin. Enclosed is a photo of the President with part of the group. From left to right: Yuli Edelstein and Morris Abram. Mary Dewhirst, Associate Director of the White House Office of Public Liaison, is seated behind them.